Successfully Added Ordro Q603 Dual Cam Car DVR - 1/4 Inch CMOS, 2.7 Inch TFT LCD Display, 150 Degree Wide Angle Lens, Micro SD Support to your Shopping Cart. With dual camera inputs, a spacious 2.7 inch screen and micro SD storage the Ordro Q603 Car DVR is well specced out and brings quality footage when you need it most. With two 1/4 inch CMOS cameras that have a f/1.9 aperture you can monitor twice as much letting you see what goes on behind as well as in front of the your car in 1280x480 resolutions. The 150 degree wide angle lens on each of these two cameras lets you cover the rear and front of the car effectively helping eliminate blind spots so nothing will go unnoticed. The cameras can even double up as parking cams and help you in and out of those tight parking spots without getting a scratch on your car. Coming with a suction cup to hold it firmly in place on your windshield this compact car DVR set can be placed conveniently in your vehicle without obstructing your view and its built in battery brings up to 15 minutes of usage even if you turn off the engine, perfect for by the road playback. 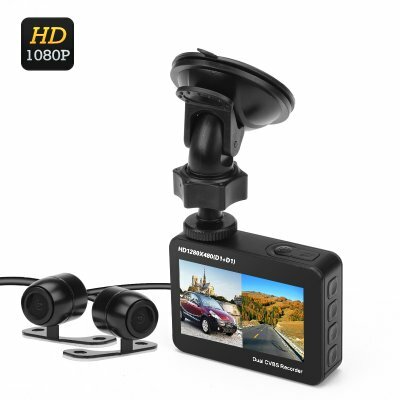 Don't be caught out by fraudsters or suffer liability from careless drives, this car DVR will bring you double the protection from unscrupulous claims because two sets of eyes are better than one. especially when the record every event as it unfolds. This Car DVR comes with a 12 months warranty, brought to you by the leader in electronic devices as well as wholesale car video gadgets..